New York, NY, January 31, 2013 - New York Sea Grant (NYSG) will be 'at the table' tonight as Cornell University's College of Agriculture and Life Sciences (Cornell CALS) serves up a treat for foodies in Manhattan. The Cornell CALS event, "From Furrows to Boroughs: A Taste of New York State in New York City," is being hosted by Dean Kathryn Boor and will be held at 28 Crosby in SoHo from 6 - 8:30 pm. In addition to attendees feeding their culinary curiosity with an array of delicious food, they will be served plenty of facts about the work Cornell CALS is doing with farmers, producers, and entrepreneurs to satisfy New York City's appetite. This "from farm to fork" event provides invited attendees with an opportunity to interact one-on-one with Cornell researchers, alumni, and friends who have a direct impact on feeding New York City’s 8 million people and supplying its 20,000 restaurants. Staff from NYSG, a cooperative program of Cornell University and the State University of New York, will be on-hand to unveil the program's new poster on "Rethinking the Seafood Industry: Building Economic Resilience in Coastal Communities" (pdf). The poster is filled with healthy eating tips and suggestions on how to shop local as well as topical NYSG-funded research projects and education efforts. 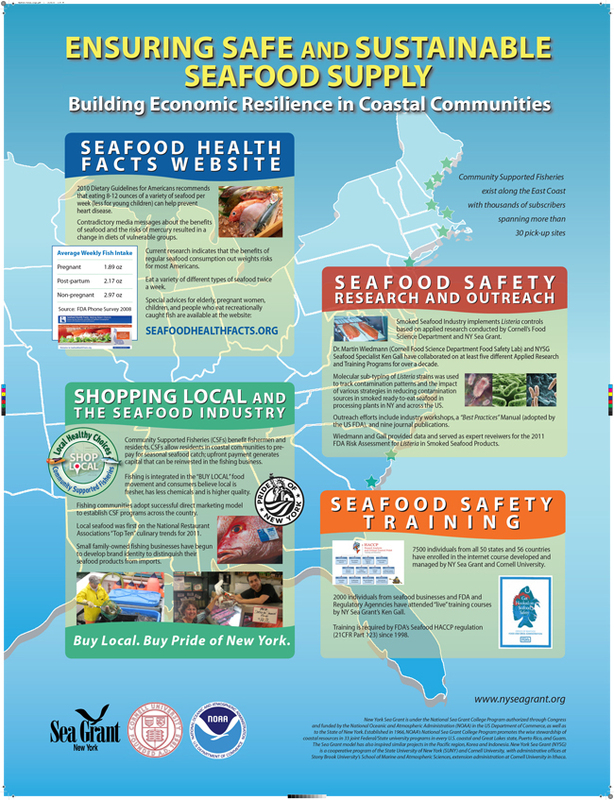 One of the primary concepts of the poster is "Community Supported Fisheries," or CSFs. “Fishermen share many commonalities with small farmers and we are seeking ways to work with fishing businesses to establish community supported fisheries programs such as those models that have been successfully applied on small farms," says NYSG Fisheries Specialist Antoinette Clemetson. This event is one in as series that NYSG has supported or sponsored in the recent past. Last summer, the program partnered with Northwest Atlantic Marine Alliance and GrowNYC/Greenmarket as well as Cornell University Cooperative Extension of Suffolk County for two separate Seafood Throwdowns. These unique cooking competitions showcase the importance of local seafood in restoring a healthy ocean ecosystem. An informative postcard and YouTube clip are just some of the related "throwdown" materials you’ll find in the “News/Topics” section at www.nyseagrant.org/marinefish.